Okay, so we probably won’t get to see drinks thrown in opponents faces by jewelry-laden, augmented ‘housewives,’ but we might get a glimpse into the dedication, talent, drive and finances required to make it onto the Pro Tennis Tour. Former Georgia Bulldog Brad Benedict and Actor/Tennis Player Jeremy Mitchell aren’t filming our beloved Portland Area Women’s City League (probably too much material to edit through)… but they are dedicated to bringing the life of the Pro player to the big screen. John Isner, who is currently the highest ranked American player, tweeted support for his former teammates on Tuesday: “Check out this tennis film a former Georgia Bulldog teammate @bpbenedict is producing: http://kck.st/KSh9mX My acting debut!” Fellow ATP Member Sam Query and John will both have cameos in the film. Johnny throws out his teaser during an interview at Campbell’s Hall of Fame Championships. You can see more and support the film here: Kickstart.com/projects/thetourfilm. Best of luck to Jeremy and Brad on The Tour! I had the pleasure of playing and participating this past weekend in the PATT tournament run by Mike, Wally and Nancy Yee. What started 50 years ago as a community building event with just a few players, has turned into a large, open event offering great prizes (well, of course since Swing Set offered a few) and some fantastic players traveling from far and wide to participate. One of the best surprises, was watching players who are not members of some elite club or team, but grew up playing in city parks and competed simply for the love of the game. If you are interested in playing or donating for next year, you can find PATT on Facebook or online Yee Enterprises. Sad news for our friends Jeremy Mitchell and Brad Benedict as they did not reach their goal for fundraising on Kickstarter.com. I didn’t help much either, since I had an incorrect link! However, they will still be working to make the film and finding other ways to fundraise. If you are interested, please go to “Kickstarter/projects/The Tour” to find Jeremy’s contact info and watch a trailer. Please consider donating to help some young, aspiring players! Best of luck to Jeremy and Brad! Will heads roll at Adidas? Or should I ask “will balls roll”? We know the answer is yes to the latter. During Andy Murray’s third round match against Marcos Bagdhatis, he lost two points due to a ball dropping out of his shorts during play. From an article by Chris Chase of Busted Racquet; “According to Murray’s outfitter, Adidas, [We work] closely with Andy on the design of all his kit and we believe the issues were the result of an individual technical error in the handmade pockets of those shorts…” I appreciated the reference to the ‘handmade’ pockets as Mr. Chase did, not to mention the well played drop shot of throwing the poor seamster/seamstress under the bus! I would like to hear Adidas’ response to the fact that it happened AGAIN during Murray’s match against David Ferrer. The importance of that match seems to have superseded the fact that Andy’s shorts came up er, well, short again. Murray switched to the Adidas Barricade Bermuda shorts and is still on track for Friday’s semifinal matchup with No. 5 seed Jo-Wilfried Tsonga. Hopefully, the shorts change will ‘ahem’ clean up the mess. I for one, will be watching Andy’s balls. I suggest Adidas do the same. 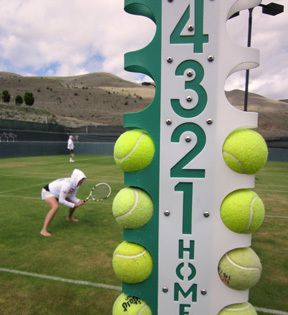 Just returned from a fantastic time at Baker City Grass Courts, the ONLY Grass Courts we have in the Northwest (in fact, within a thousand mile radius). These courts are a little known treasure run by owner Don McClure since 2007. 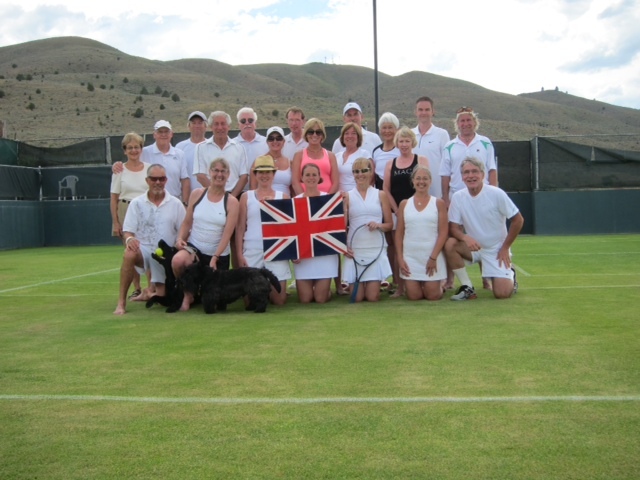 A non-profit organization called SAGA (Save the Grass Courts Association) has been established to help maintain the courts and organize play. This weekend was the REAL WimbleDON and the competition would have made even Rafa proud. Running around barefoot in tennis whites truly captures the spirit and joy of the game. Try it out for yourself, and please consider donating to help save this wonderful site. Thanks to all the ‘killers’ who attended WimbleDON 2012!